Photo: "a $1 portrait of a man with a brown paper bag on his head" by blogTO Flickr pooler Lu. Exposure to lead can result in developmental delays in kids, and several Ontario communities have lead in their drinking water. As a result, new laws for testing water at schools and daycares are swiftly coming to be. Our government seems to be coming through for us on this one, and quickly. Sometimes the probers need to be probed. Ontario's Ombudsman will be conducting an investigation of the SIU to address allegations that the citizen-based watchdog has a pro-police bias. Has the Ombudsman ever been probed? A misunderstanding involving a father and daughter taking a walk in Rosedale being mistaken for a dishevelled homeless man dragging a girl into the woods led to an unnecessary, costly, and frantic 4-hour search by police. Oops. If I were the father, I'd be shaving off that beard this morning and skipping and whistling my way into the woods from now on. St. James Town, one of Toronto's most diverse and poorest communities, is having its third annual community festival this weekend but not with any ease. For the first time, the city slapped organizers with a last-minute permit fee that has them scrambling to come up with the extra cash to keep the festival alive. 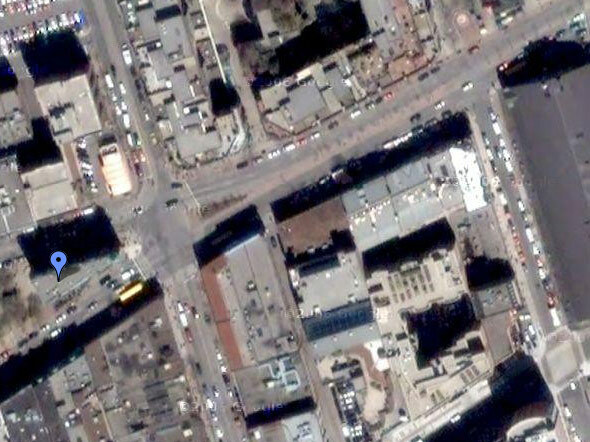 Yesterday's answer: Bloor W and Dundas.